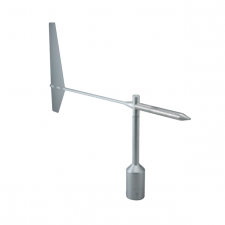 High sensitivity mechanical cup anemometer designed for the measurement of the horizontal component of the wind speed for site evaluation and the measurement of capacity characteristics of wind power systems as well as meteorological applications and environmental measurements. The Advanced First Class sensor is Class A, B and S accredited acc. IEC 61400-12-1 for site assessment and power performance of Wind Turbine Generators. The sensor characteristics are optimised for dynamic behaviour, even in high turbulence intensities with minimal over-speeding and a low starting value. The sensor is available in a number of variants including digital and analogue outputs. Heated versions are available for use in regions prone to freezing. < 0.1% from the cosinus line (in the range of +/- 20 degrees) – unable to verify this information? < 1% (in the range up to 30% turbulence intensity) – unable to verify this information?